Whether or not you eat turkey, the bird is the most iconic symbol of the Thanksgiving holiday. Dress up your dinner table, your home, or your desk for the holidays with a little amigurumi crochet turkey. These ten free crochet turkey patterns each have their own little sense of style! Of course, you can also enjoy these patterns all throughout the year. They make great gifts for kids. The feathers stand out on this crochet turkey. Worked in two different colors with brown edging to keep them all cohesive, they are a key identifying feature of this adorable stuffed toy. This is the kind of project that most people are thinking of when they want to make an amigurumi turkey. It is the most classic design in the roundup. You don't have to get too complicated with body shaping to make a crochet turkey. In fact, this design is basically just a round ball. The feathers and the feet help you identify it as a turkey. Beginner crocheters should find this to be a helpful free pattern. If you're looking for a good place to start with your first amigurumi project, this one will set you on your way. 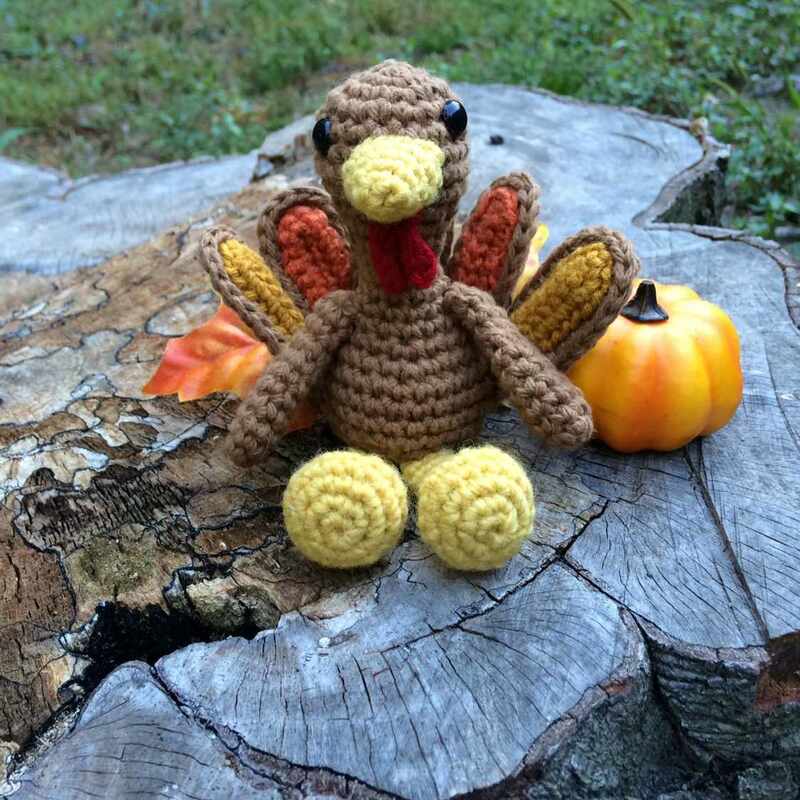 This amigurumi crochet turkey is unique because its wings are made using five crochet granny squares. It takes a classic motif, turns it on its side and uses it really creatively. It's fun to make and it makes this guy look great on any Thanksgiving display! In fact, it looks a little bit like a turkey made from a folded napkin. Therefore, it's perfect to set one or more of these on your table. Designer Teri Crews calls this amigurumi pattern "cute turkey" and you can see why. It is, well, super cute. It has that awkward "ugly duckling" thing going for it. You can see the personality even though it's just a toy. This is an example of why people really have a lot of fun making amigurumi items. Have you ever thought about changing up the color of your crochet turkey, going with a purple turkey perhaps? Sometimes a designer does something like that and it inspires the rest of us to get more creative. The wings on this one are unique as well, worked as a single spread instead of individual feathers. These little details are unique, and it shows you that there is almost no end to what you can do to change up a crochet design. After you have made a few of the turkeys in this roundup, you might want to crochet a design of your own. You don't have to change the color of the turkey to make it a bright, bold design. Instead, you can play with just the feather colors. These feathers are sparkly, bold, and rainbow-hued. They make a turkey that will delight anyone who sees it. Of course, children really love colorful toys. Therefore, if you want to make an autumn gift for a child, this is a good pattern to use. The four cylindrical feathers on this turkey give it a cartoonish feeling that is really adorable. It's a free amigurumi turkey pattern accented with a perfect red comb and gobbler. Can you believe that all of these crochet patterns are free? This is one of the smallest amigurumi turkey patterns you will find. It works up quickly as long as you know what you are doing with small crochet hooks. Just because it's small doesn't mean it lacks detail, though. Every little touch has been considered. Plus, its rounded design makes it extra precious. This is the kind of crochet turkey that you can set on your desk to brighten the season. If you don't feel like making a whole crochet turkey, then try something different by making just a turkey leg! This free crochet pattern from NyanPom is for a tiny turkey leg worked using ​an F size crochet hook. In addition to Thanksgiving decor, this is a great pattern for a crochet food playset for children. 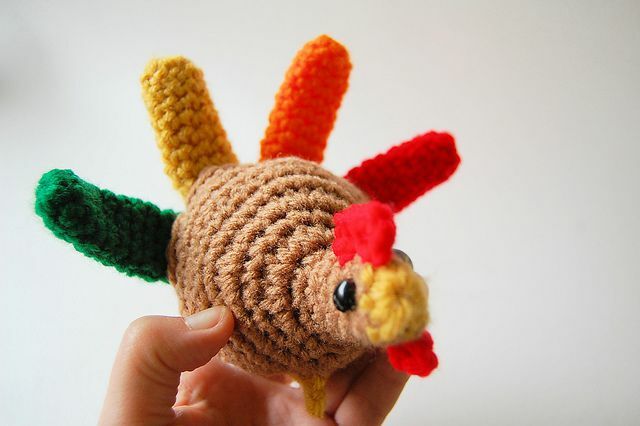 If you like the idea of making crochet food, but don't like the turkey leg above, then consider making a whole tiny turkey. This adorable plate will make your Thanksgiving guests smile. There is a video tutorial to accompany this free crochet pattern.